I don’t know of a food more universally well-liked or commonly eaten than chicken. We certainly eat it quite often. For that reason I feel the need to have a large variety of recipes featuring chicken. Whenever a new one comes along that looks interesting I try it out. The recipe in todays’s post is a new one for me that I took for a walk around the kitchen this weekend. It turned out quite well, and was tender and tasty. The preparation of this dish is simple: mix up the marinade ingredients in a plastic zip-lock bag, add in the chicken pieces, marinate for at least an hour, then oven bake or cook on the grill. 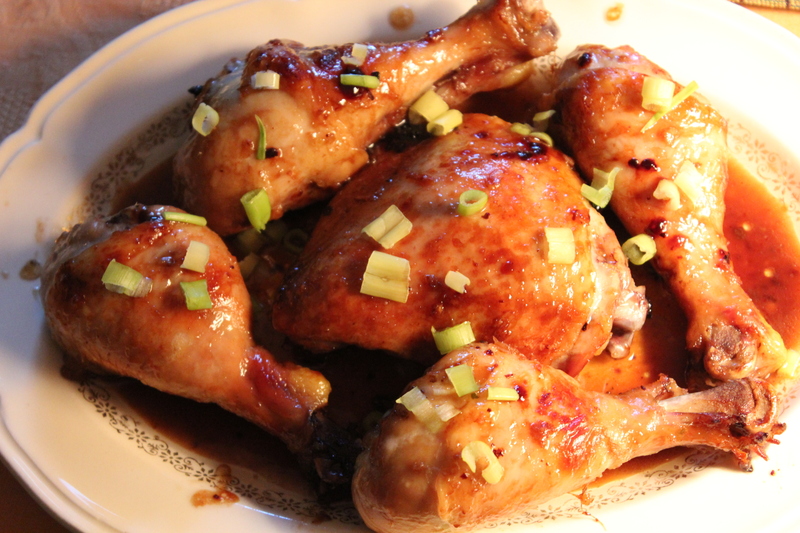 The marinade provides a nice flavor of maple mixed with the typical asian ingredients of soy sauce, fresh ginger, and sesame oil. A little crushed red pepper flakes gives it some “punch”. 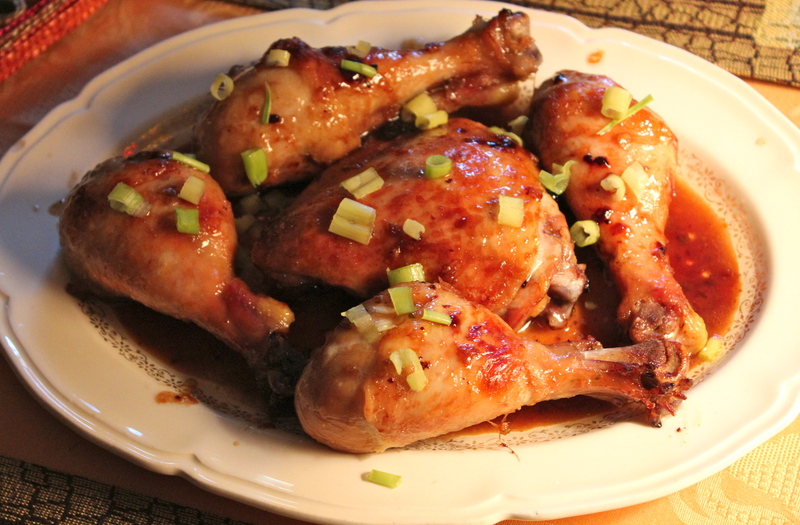 This recipe will be a keeper in my file for chicken dishes. 1. Combine first 7 ingredients in a small bowl, stirring with a whisk. Place in a large zip-top plastic bag. Add chicken thighs to the bag and seal. Marinate in refrigerator at least 1 hour. 2. Preheat oven to 375 degrees or prepare grill. 3. Remove chicken from bag, reserving marinade. Place marinade in a small sauce pan over medium heat; Bring to a boil. Cook until marinade reduces to 1/4 cup (about 5 minutes). Arrange chicken in a single layer on a foil-lined baking sheet, or place on grill. Baste with the maple mixture, sprinkle evenly with salt. Bake chicken at 375 degrees for 20 minutes. Turn pieces over, baste again and continue cooking for another 15 minutes or until chicken is done. Same procedure for cooking on a grill. Before serving, sprinkle with green onions. To complete this meal I served fresh green beans and couscous, adding some orange sections and sliced almonds to the couscous. This, along with a glass of our favorite chardonnay, was a most enjoyable dinner in deed. To finish it off in grand style we had home-made peach ice-cream. Dee-lish! I’ll be telling you about that tomorrow.